WWF Free Rivers – An Interactive, Augmented Reality Story About Rivers – TC Net-Works, Inc.
WWF Free Rivers is a free augmented reality iPad app produced by the World Wildlife Foundation. The app uses augmented reality to present a story about rivers. In the app students learn about the importance of free-flowing rivers in world. The app offers a series of sections or experiences through which students can learn about how free flowing rivers support wildlife, agriculture, and people. WWF Free Rivers tells students stories about the implications of changes in weather patterns, damming rivers, and pollution on river ecosystems. Students interact with these stories by moving their iPads and or by pinching and zooming on elements in the stories. Unlike some other AR apps the animations within WWF Free Rivers can be experienced by students from a variety of angles. 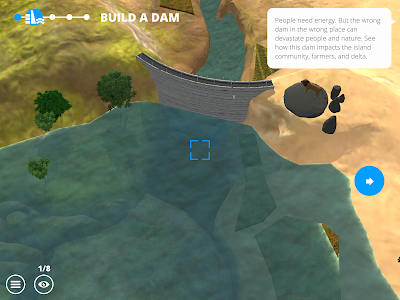 A great example of this is found early in the app when students can see what a dam does to a river. During that experience students can see the dam from above, from below, and from the sides. WWF Free Rivers could be a good app to incorporate into a science or geography lesson. The app can be used by students without the need to sign-in or sign-up for an account in order to use the app. Despite not needing to sign into the app, students can close their iPads and pick up the story wherever they left off provided that they don’t tap the button to restart the stories.